An interior designer has the power to step into a drab space and transform it into something beautiful. Are you considering a career in this fascinating, creative, and fun field? 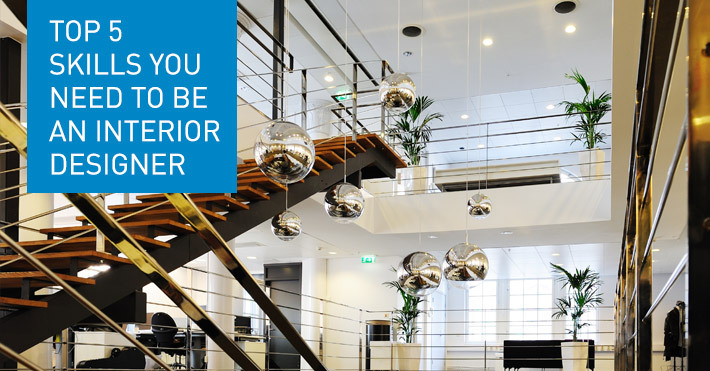 Here are the top five skills you need to be successful as an interior designer. Creativity. At its core, interior design is a creative profession. If you enjoy letting your creative impulses reign this might be a great career path for you. In the interior design field creativity is born from understanding the rules and knowing when to apply them—and when to break them. Critical Thinking. As much as you need your creative juices flowing, you will also need sharp critical thinking skills. You may have a particularly challenging space or a client with a specific set of needs—whatever the issue, your critical thinking skills will help solve it. History of Design. Maybe your client is looking for something in an art deco style or wants you to add a midcentury modern flair. Understanding historical context and the trademarks of different historical design styles will help you execute different looks for you clients. Spatial Awareness. Making a beautiful, useful space includes ensuring that the flow of movement through the space works and that the space is used efficiently. Your keen sense of spatial awareness will help you achieve these objectives. Computer Skills. Computer skills are key in the interior design profession today. Leveraging the latest technologies will help you sketch up design ideas and create renderings of your vision for an interior space. Certificate of Interior Design (Foundation Level)—this open enrollment program gives you the fundamental skills to succeed as an interior designer. Master of Interior Architecture Degree (Advanced Level)—this CIDA accredited program, ranked #3 in the nation,* teaches you the highest standards of professional practice in the field. Offered on a part-time or full-time basis, this competitively priced master’s program can be completed part time, allowing you to work while you study. You can find out more about UCLA Extension’s Architecture + Interior Design Program by visiting http://arcid.uclaextension.edu.